Hunter, a photo by The Bacher Family on Flickr. Earlier this month, I received an e-mail from my father confirming that my grandfather, Milton Trumm, had passed away in South Dakota. This wasn't entirely unexpected, but a funeral is always a drop-everything-and-buy-a-plane-ticket event. This was a side of the family I didn't know very well, both due to geography and an epic bit of family history that would take too long to explain here; so I spent the weekend getting reacquainted with people I hadn't seen for many years and, when I could, snapping an occasional candid portrait. I'm including all of the best ones at once here, because they're thematically related. First is Hunter, my cousin's son, who was camera shy most of the time but indulged me for this one shot. 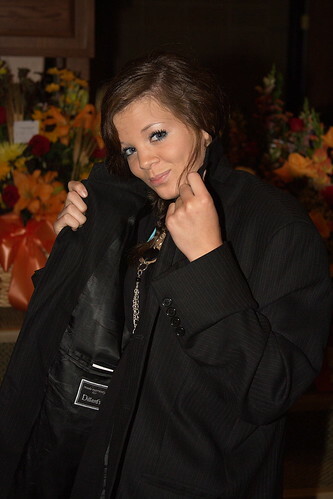 Below is his sister Morgan, trying on her uncle's suit coat. Next we have Lucas Glaesman, whom I had just met an hour before this picture was taken, at the family visitation. 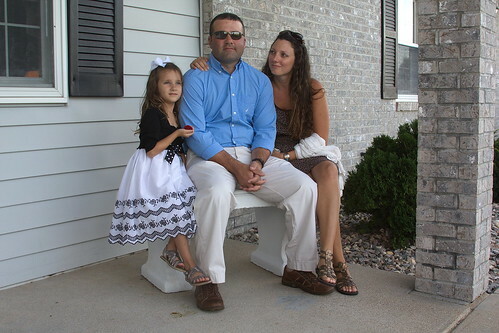 Tara and Elisa's brother Erik is pictured below, with his wife Corrie and daughter Arabella. Erik is a pilot in the Navy, currently stationed in Tampa, Florida.